Castle c.1938, Okinawa Prefecture, Japan. Okinawan Karate-do is a fighting style over 500 years in the making. Okinawa, known then as the Ryukyu Islands, was originally three kingdoms; Chuzan, Nanzan and Hokuzan. After the kingdoms were united in 1429 by King Sho Hashi, sometimes known as King Shoshin, a decree was announced, prohibiting the use of weapons by the island people. In 1609, the Shimazu clan of Satsuma in Mainland Japan invaded the Ryukyu islands, and again imposed the decree prohibiting the use of weapons. 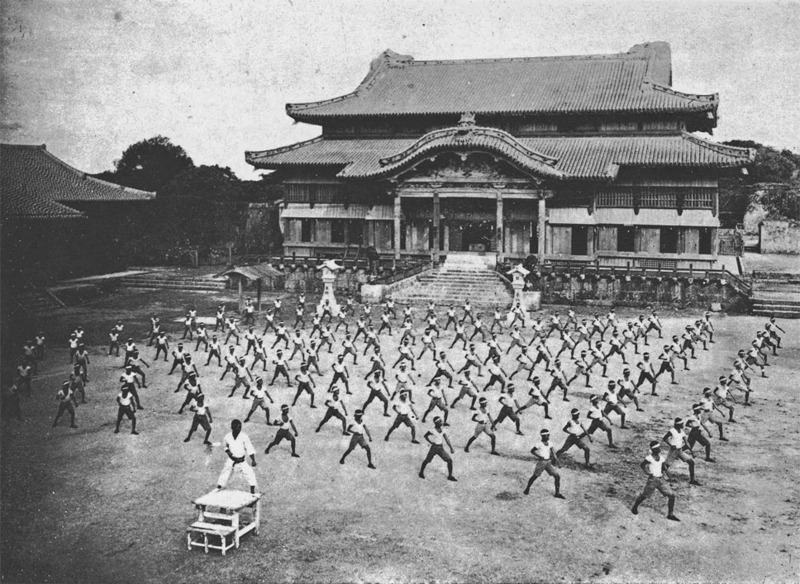 Between these two incidents, the island people began to develop a form of martial arts called simply Te(hand) or To-te(Chinese Hand), a form of martial arts of Chinese origin currently unknown to mainland Japan. To keep it hidden, To-Te was practiced in secret. 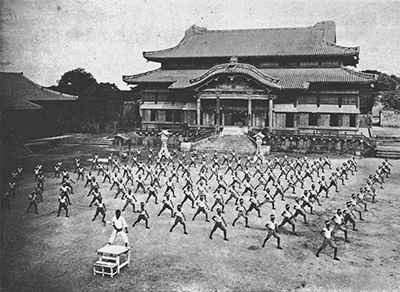 They began to develop their techniques into solo dance-like forms called kata, which allowed them to hide their practice, while continuing to develop punching, kicking, grappling and throwing techniques. Another pronunciation of the word To-te was kara-te. In the late 1800’s, Te was incorporated into the Okinawan school education programs, and the kanji (Japanese characters) for kara was changed from meaning China to meaning empty; thus, karate (empty hand) was born. Originally there were two forms of karate-do named Shuri-te and Naha-te, after the regions in which they originated. The Shuri-te style was primarily developed by Master Anko Itosu, and went on to become the modern style Shorin-ryu. Naha-te was primarily developed by Master Kanryo Higaonna (also pronounced Higashionna) and later went on to become Goju-ryu, the style we practice at Sho Rei Shobu Kan today. For more information, please view the next page, history of Goju-ryu karate.